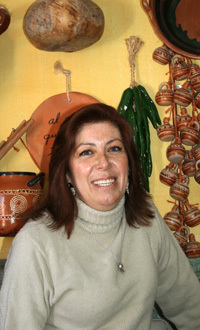 Marilau Mexican cooking school classes in San Miguel de Allende, tradition, hands on, customized menus, small groups. I’m happy to design an intensive one-on-one session or series of classes for you, or, if you’d rather be part of a group, we can arrange that, too. I take pride in customizing my classes to suit the needs of all students in my well-equipped Mexican kitchen classroom, with a maximum of 10 students per class to insure individualized attention to each. I love sharing my heritage of classical Mexican home cooking with my students. From my earliest years, I watched my mother, my aunts and grandparents in the kitchen. I’m happy to design an intensive one-on-one session or series of classes for you, or, if you’d rather be part of a group, we can arrange that, too. I take pride in customizing my classes to suit the needs of all students in my well-equipped kitchen classroom, with a maximum of 10 students per class to insure individualized attention to each. Your class can be from Monday to Friday, starting at 10:00 am. A special schedule can be arranged for private groups. A minimum number students apply for each class. Spend a morning preparing one of my family’s heirloom menus. Enjoy a cafe de olla or an agua fresca as we work, and then relish the results. Invite family and friends to share the feast (small additional charge). 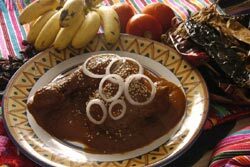 4 Day intensive workshop, covering everyday & festive salsas, adobos, pipianes and mole. 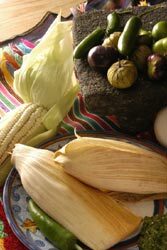 Learn how to prepare nopales (cactus pads), how capeado (egg-white batter) is used, how to prepare dry and fresh chiles for different dishes, and many other tips. Mix and match, make up your own menu. You decide what dishes and/or techniques you want to learn. An intensive introduction to Mexican cuisine. San Miguel is a wonderful place to live but it isn't exactly one of the renowned centers for traditional Mexican food. As I spend my time writing about food and its history, I've always felt a little guilty that I wasn't heading off for Puebla, Oaxaca, Michoacán and Veracruz, famous for their culinary traditions, instead of enjoying the good life in Guanajuato. That's not to say that you can't eat really well here. I've enjoyed wonderful meals in both homes and restaurants. But when visitors turn up expecting me to put them on the inside track to the best of Mexican food, I have found myself shuffling my feet and apologizing for not being in one of the shrines of Mexican cooking.